2 double bedroom house ideally situated near Warrington Hospital and Town Centre for rent for £500 per month. For details on this property to let please email us. 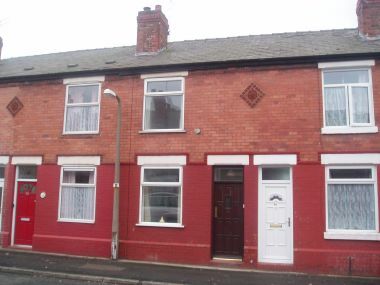 This two bedroom house in Grafton Street, Warrington is currently let. Available to let this house is a well proportioned two bed mid terraced property, which is within walking distance to Warrington hospital and town centre. The property comprises to the ground floor of entrance hallway, lounge, kitchen / diner, bathroom, to the first floor there are two double bedrooms and a rear yard. The house is finished to a high standard throughout and benefits from double glazing, full gas central heating, downstairs bathroom with shower, fitted kitchen and rear yard. Property is let including, electrical cooker with extractor & electric wall mounted fire in the lounge. The house is near to Warrington Hospital, just off of Lovely Lane. The area is well served with local amenities & schools and is within walking distance of Warrington Town Centre. Up to two residential parking places are available on street. Click here to view a location map. Other properties available to let in Manchester and Cheshire. House to Rent - Grafton Street, Whitecross, Warrington, Cheshire WA5 1QB. Stylish, fully refurbished two bedroom house to let in Warrington near to Warrington Hospital and town centre.